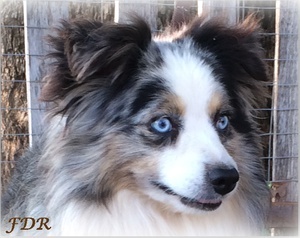 Ranch raised quality purebred ASDR Toy and Miniature Australian Shepherds "Aussie". We strive to raise our Aussies to reflect the awesome beauty, intelligence and agility of the Australian Shepherd breed. Our goal is to provide you with a smart, beautiful, healthy, sound, and good tempered Aussie that conforms to the breed standard. All puppies are by health tested parents. Our puppies are raised with small children and lots of activity.